By now, you're probably much more than familiar with the "modern farmhouse" look — it has been one of the most popular design concepts of the past few years. You've seen the deep sinks and shiplap walls, and you've noticed the warm finishes and homespun textures. But acknowledging this trend and actually incorporating it into your own home are two different things: after all, how exactly do you make this look come together? 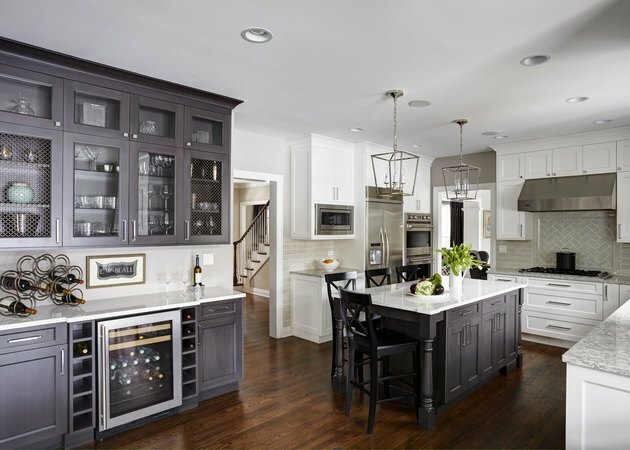 The best thing about this style isn't just how photogenic it can be, it's that it's easy to recreate with a variety of budgets and kitchen sizes. So, now is the time to go for it. Here are the key components of the modern farmhouse look, inspired by the gorgeous kitchens of a few of our favorite designers and bloggers. Of course, a farmhouse sink is ideal for achieving this style, but the extra-large basin is very handy — especially when cleaning up after a dinner party. 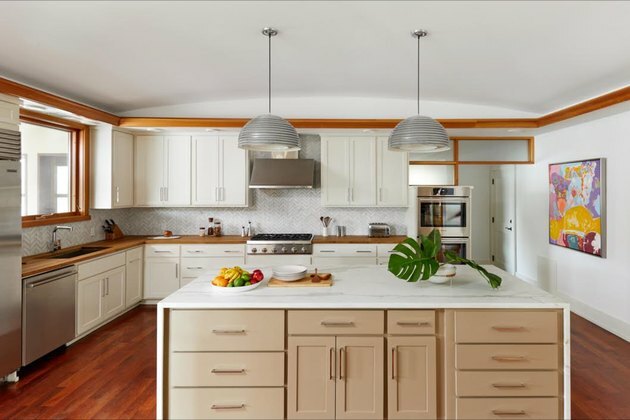 This impeccable kitchen by Aidan Design coordinates with the cabinets and countertops for a cohesive look. The casual feel of the modern farmhouse look means that you simply can't go wrong with finishes. 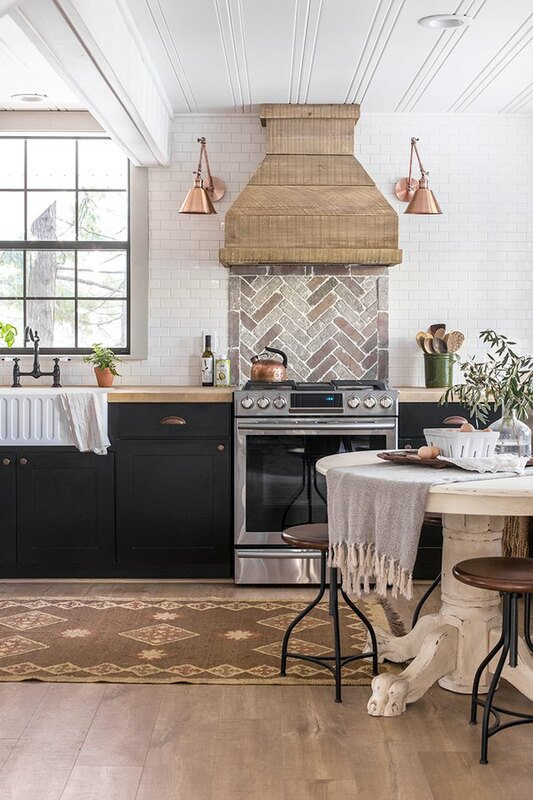 In this kitchen makeover by Jenna Sue for Lowe's, an oil-rubbed bronze faucet is paired with copper metal lights and a stainless stove. 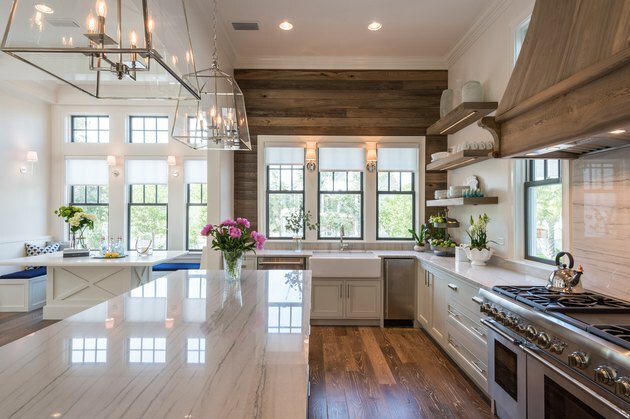 While white shiplap is undoubtedly popular thanks to "Fixer Upper," stained wood planks offer a new take on the trend. This kitchen by Cynthia and Alex Rice of Old Seagrove Homes uses different hues for a gorgeously eclectic result. 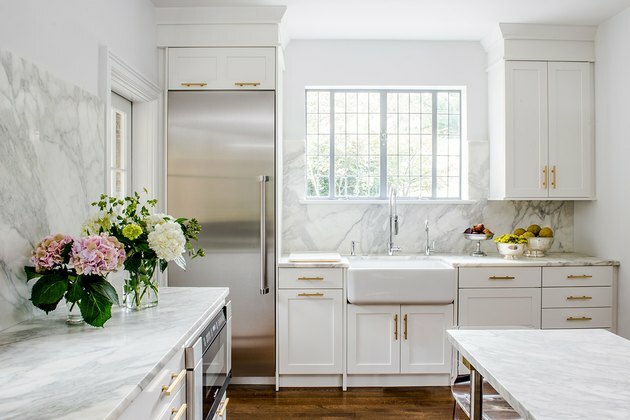 Flooring can make a huge impact in a space — especially in the kitchen. 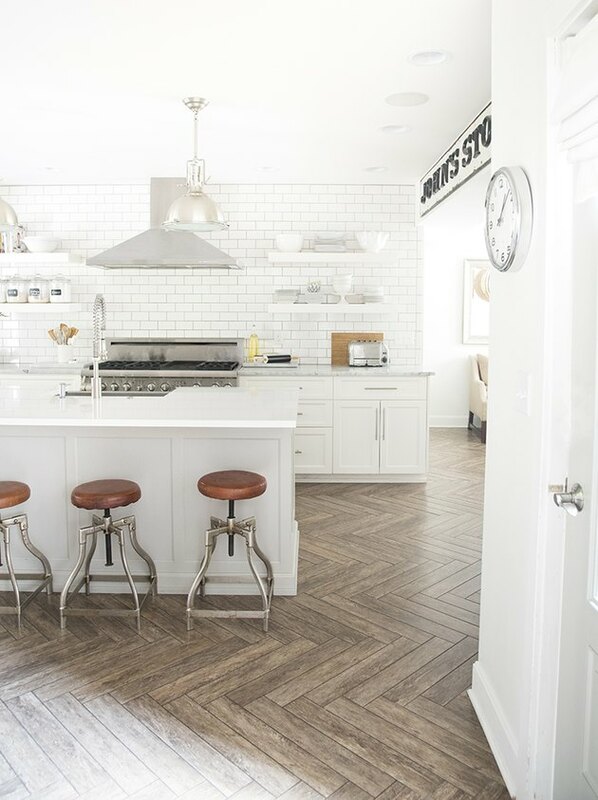 The herringbone wood floor of this family-friendly white kitchen photographed by Sarah Gibson on the Room For Tuesday blog adds extra character to an already-gorgeous design. These seats feel more current than the '90s version of the farmhouse look, while also making the space feel more inviting. Here, darker-stained stools coordinate with the cabinets in this kitchen by Nancy Jacobson of Kitchen Design Partners. 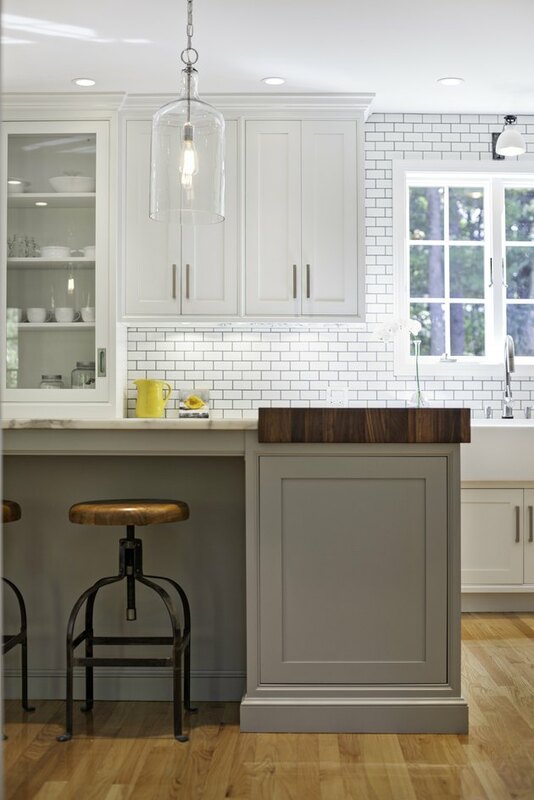 In this bright kitchen by Karen Swanson of New England Design Works, the overhead pendants add a subtly modern touch while still preserving sight lines. Martha Stewart always gets this look right, which is why we're highlighting this design from her paint collection for Home Depot. 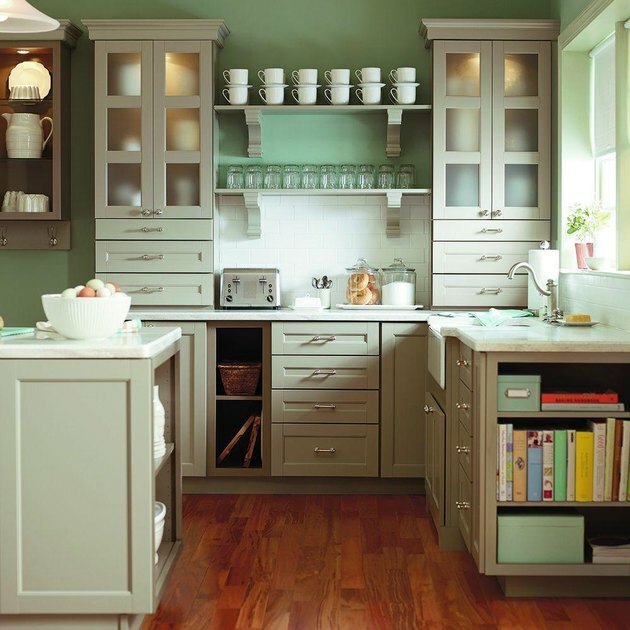 Floating shelves elevate glasses and mugs into a lovely design feature, and their muted green shade unifies them with the cabinets. A dash of the unexpected keeps the modern farmhouse style from coming across as cookie-cutter. The colorful canvas work in this kitchen by Jennifer Fisher of J.Fisher Interiors brings in an unexpected kaleidoscope, which adds depth to an otherwise simple space.